Bike lanes come to Waterloo as part of a pilot project in UpTown. July will see the region of Waterloo install a 4.45 kilometer network of bike lanes. The lanes will connect the University of Waterloo and Wilfred Laurier to UpTown Waterloo. This comes after the region’s tests of new cycling infrastructure which studied bike lanes separated from traffic by flexible bollards or concrete curbs. The network starts at UW, goes on along University Avenue, north on King Street, west on Columbia Street, and does a short leg along Erb Street to reach UpTown. These roads were specifically selected so as to provide as many direct routes between the university campuses and residential areas as possible. 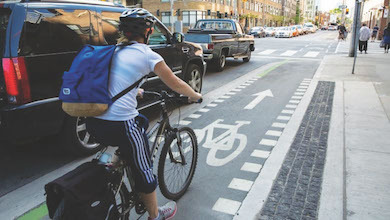 ”I think it’s a good start, Columbia and University are both pretty terrifying to ride a bike on, and separating cyclists from traffic will make them far more inviting for cyclists of all ages,” Robin Mazumder, cycling advocate, told The Record. On the other hand, some individuals think that the network could be controversial. Reducing King Street to one driving lane between University and Columbia in each direction, and Erb Street to two driving lanes would affect traffic negatively especially during rush hours. The region will first run the project as a pilot for 18 months to see how easy it is to maintain, how road traffic is affected, how many cyclists use the trail and what people think of the special lanes.